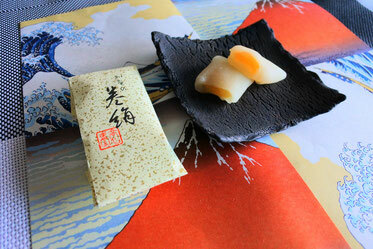 I'd like to post about Japanese sweets Kanazawa in Ishikawa, the city is one of great Japanese wagashi sweets place. I got some Wagashi in Kanazawa. 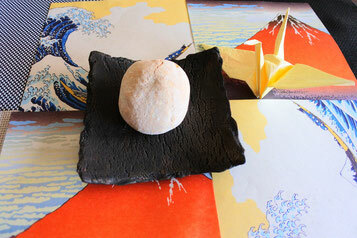 This is ``Makiginu 巻絹`` one of well known wagashi in Kanazawa, the name came from Noh play ``Makiginu``. Its inside is sweet bean jam mixed with white miso and covered with habutae rice cake,the taste is not too sweet and not too soft, I'm satisfiled I could eat nicer wagashi. 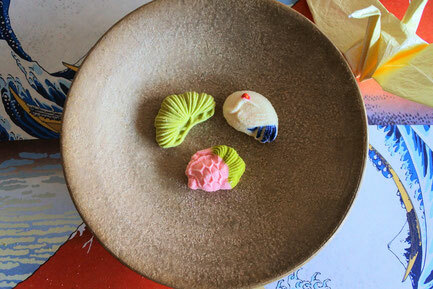 I got these cute wagashi at the same wagashi shop. It's called ``Turu Kame 鶴亀`` Turu means crane Kame means turtle. It made from wasanbon that is fine grained Japanese sugar. The green might be a pine tree, white blue is turu (crane), green pink is kame (turtle). 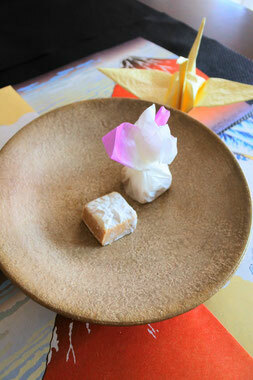 This wagashi is called ``Mugibue 麦笛``. Mugibue means barley-straw whistle. 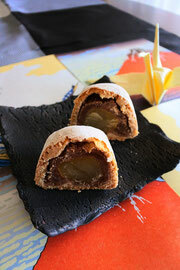 Its inside is sweet bean paste and a whole chestnut coverd with barley dough. It was tasty. I enjoyed all of these Wagashi, I'll write about kanazawa trip soon !! actually, I love wasanbon, any sweets (even cookies!) are made from wasanbon is amazing !